Electrospinning is an electrostatic spinning technique that can be used to produce submicron fibers from (bio)polymer solutions or composite formulations. Such nanofibers have been shown to possess unique properties that distinguish them from non-woven fibers produced by other techniques, e.g., melt blowing or wet spinning. First, the electro-hydrodynamic process involved results in a high orientation of polymers within the fibers, thus displaying improved mechanical properties. Second, during the fiber spinning, the solvent is rapidly evaporated, thus allowing for the production of fibers potentially composed of polymer blends that would typically phase separate if spun with other processes. Third, the nanoscopic dimensions of the fibers lead to very high specific surface areas compared to their volume, in addition to high porosity with interconnected voids. Due to their peculiar characteristics, the use of electrospun polymer and composite 3-D scaffolds and devices is currently being exploited in miscellaneous areas, including tissue engineering, drug delivery, energy storage, and nanotechnology. The Conference will include sessions on the design of novel electrospun (nano)fibrous polymer and composite materials, on their characterization and properties, and on their application in various fields. 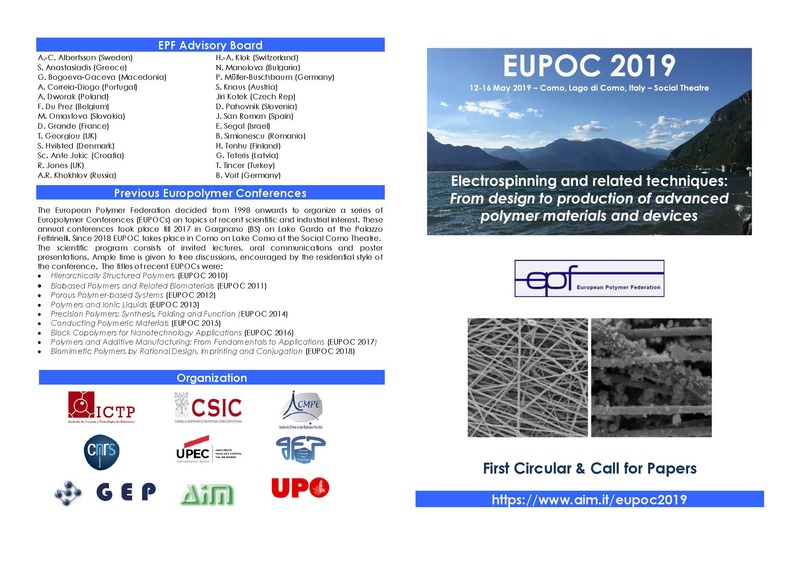 This will be one of the rare occasions that a conference focuses upon the wide spectrum of topics related to electrospun polymer research and development.